Preheat oven to 400 degrees. Combine onions and oil in 13″ x 9″ baking dish. Spread in an even layer. Roast until onions are golden, about 35 minutes. Remove them from oven. Stir in the artichokes and tomatoes. In a small bowl, mix parsley and garlic. Set aside. Increase oven temperature to 450 degrees. Push vegetables to one side of dish and add fish. Spoon vegetables over fish. Sprinkle with parsley mixture. Return to oven and roast until fish is opaque in the center, about 8-10 minutes. Take the tomatoes, cut them in halves or quarters, and remove the seeds and juice from their centers. Also, cut out and discard the stem area. I like plum tomatoes instead of regular tomatoes. The skins are much thicker, and there are fewer seeds and less juice. Preheat the oven to 450°F. While the oven is heating, chop up the tomatoes finely. 3. 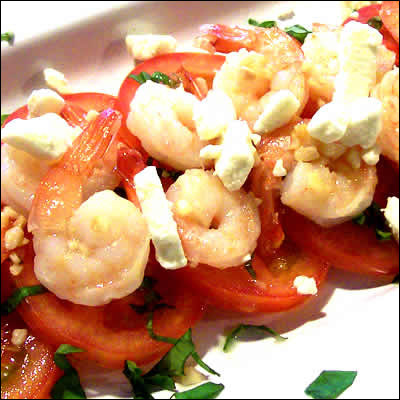 Put tomatoes, garlic, 1 T extra virgin olive oil, and vinegar in a bowl and mix. Add the chopped basil. Add salt and pepper to taste. Slice the baguette at a diagonal, about ½ inch thick slices. Coat one side of each slice with olive oil using a pastry brush. Place on a cooking sheet, olive oil side down. Once the oven has reached 450°F, place a tray of bread slices in the oven on the top rack. Toast for 5-6 minutes, until the bread just begins to turn nice and golden brown. Place the bread on a serving platter, olive oil side up. Place some topping on each slice of bread and serve. If you top each slice with the tomatoes, do it right before serving to keep the bread from getting soggy. I like to top them with a small ball of fresh mozzarella. Serves 10. Add the onions and cook 5 min. Spoon BBQ sauce over the chicken and onions. fill them with the chicken,onion and sauce mixture. 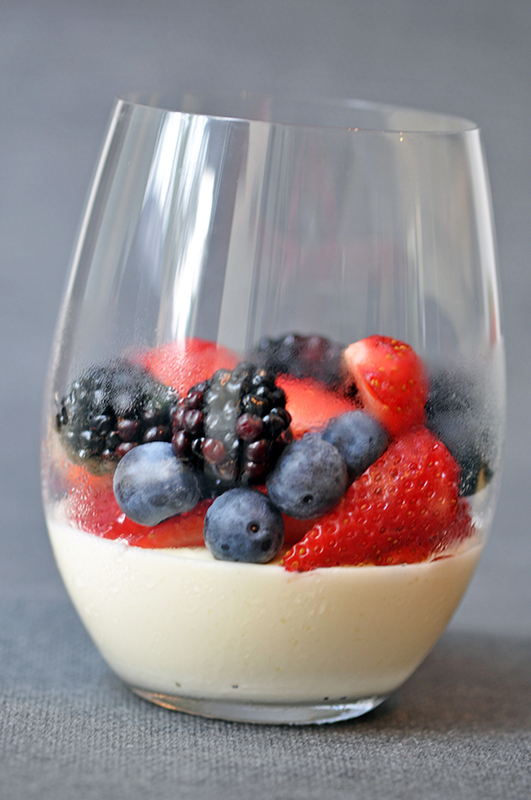 Looking for a healthy dessert recipe? Chef Robert creates a healthy and delicious dessert in minutes complete with fresh strawberries, blueberries and chocolate. Slice 4 – 1” slices of angel food cake. Toast lightly under a low broiler until golden brown. Place the angel food on a plate. 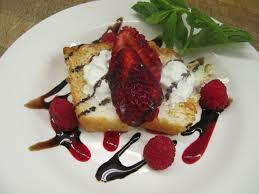 Top each piece with ½ T whipped cream. Place 1 sliced strawberry on top of the whipped cream. Sprinkle the blueberries on the dish. Dust the cake with the Stevia/cinnamon mixture. Drizzle 1 t of chocolate sauce on top of each slice of cake. Peel and dice the mango and pineapple. Place them into a bowl. Add the diced strawberries, lime juice, and cilantro. Set aside. Add the balsamic vinegar, water, and brown sugar to a small non-stick skillet. Simmer over low heat for about 10-12 minutes, or until it reaches the thickness of maple syrup. Stir often. The glaze will coat the back of a spoon. Stir frequently to keep from burning. Let cool. This mixture will thicken as it cools and can be made a day ahead of time. 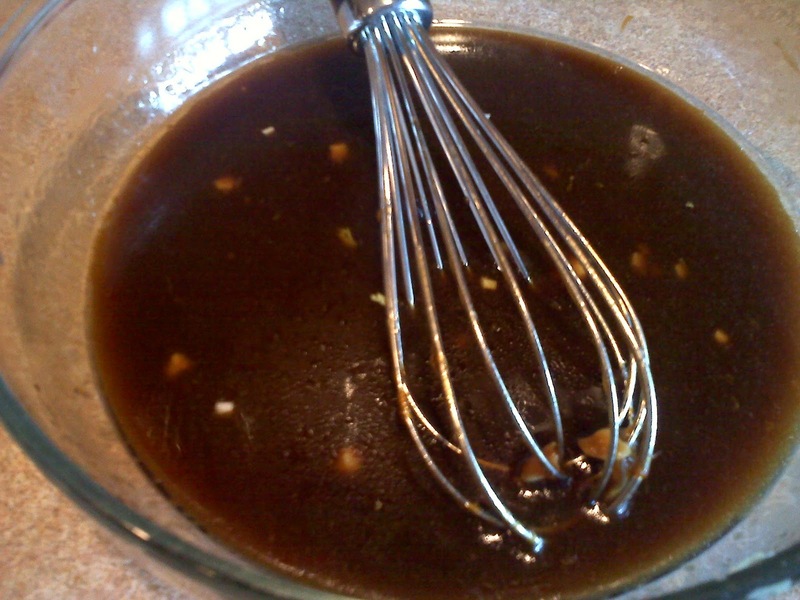 Balsamic glaze can be stored in the refrigerator for up to a month. Season the tuna with cracked pepper. Spread the chia seeds on a plate. 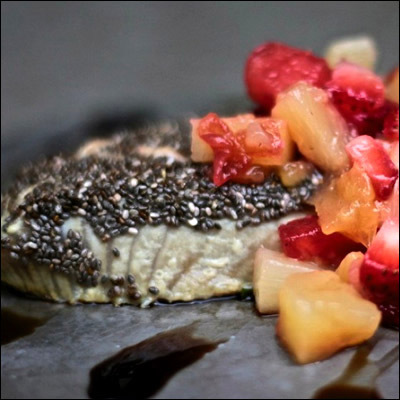 Press each tuna fillet in the chia seeds to evenly coat one side, then set aside. 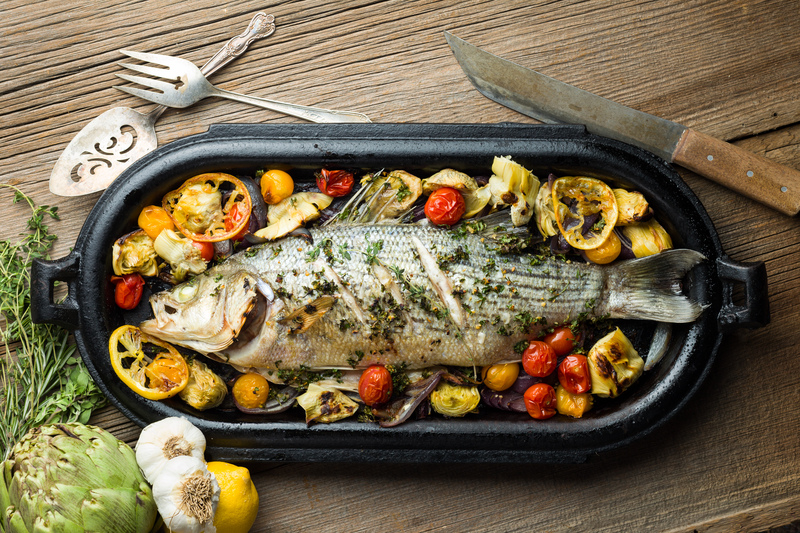 Place the fish into a non-stick oven able pan lightly coated with canola oil. Place the tuna in a preheated 425 degree oven. Roast the tuna for about 10-12 minutes. 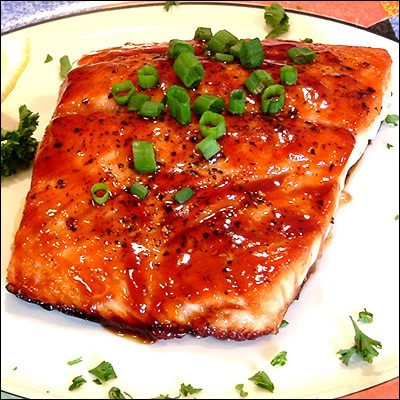 The cooked fish will be firm to the touch and the internal temperature will be about 120 degrees for medium rare. Remove from the oven and let the fish rest for 2-3 min. Place the fish on the plate. 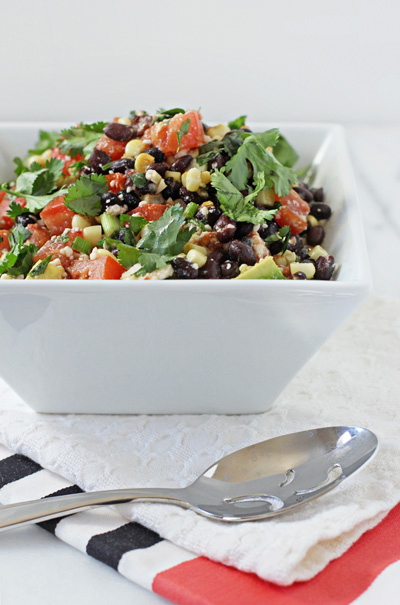 Top with fruit salsa and a zig-zag drizzle of the balsamic glaze. Heat oil in a large skillet over medium heat. Add sliced chicken and sautè about 4 to 6 minutes, until golden. 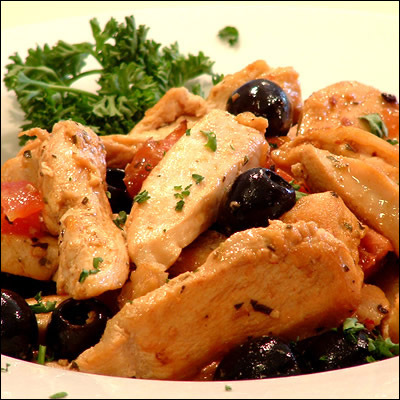 Remove chicken from skillet and set aside. Sautè garlic in pan drippings for 30 seconds, then add tomatoes and sautè for 3 minutes. Lower heat, add white wine, and simmer for about 5 minutes. Add oregano, rosemary, and basil, and simmer for 2 to 3 more minutes. Return chicken to skillet and cover. Cook over low heat until chicken is cooked through and no longer pink inside. Add olives and parsley to the skillet and cook for 1 minute. Season with salt and pepper to taste, and serve. Blanch the asparagus for 3 minutes in a pot of boiling water and drain. Heat the oil and wine in a skillet over medium heat. Add the garlic and onion and saute for 4 minutes. Toss the mixture with the asparagus. 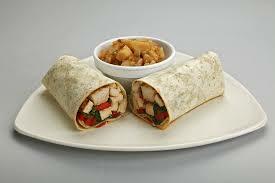 Sprinkle lemon juice, pepper, and salt to serve. 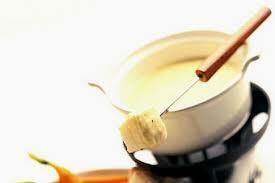 In a saucepan over medium-low heat combine cream cheese and marshmallow cream. Cook; whisking constantly until melted. Watch carefully to avoid scorching. Slowly add milk, 1 tbsp. at a time, stirring well to combine. Stir in lemon juice, mix well. Remove from heat and transfer immediately to dessert fondue pot over candle flame. Author: Chef Robert and all the kids! 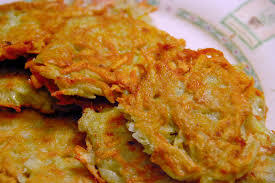 When ready to prepare the latkas, drain the potatoes. Place potatoes and onions in a food processor fitted with a knife blade. Pulse until smooth. Drain mixture well. Pour potato mixture into a large bowl. Add beaten eggs. Add salt and pepper. Add enough flour so that the mixture holds together. Carefully drop ¼ cup of the potato mixture into the hot oil. Mix all ingredients. Use as a marinade for meat and vegetables before grilling. For filling: Preheat oven to 375 degrees F. In a large bowl combine apples, 2 tablespoons sugar and Splenda sugar substitute, lemon juice, and ½ teaspoon cinnamon and nutmeg. Transfer apple mixture to a 2-quart square baking dish. For topping: In medium bowl, combine oats, ¼ cup splenda sugar substitute,chopped pecans and flour. Cut in butter until mixture resembles coarse crumbs. Sprinkle topping over filling. 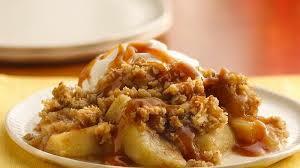 Bake for 30 to 35 minutes or until apple is tender and topping is golden brown. Serve it warm. I want to share with you an amazing and simple Chicken & Wild Rice Soup it’s thick and creamy, but has no cream at all just a little milk. 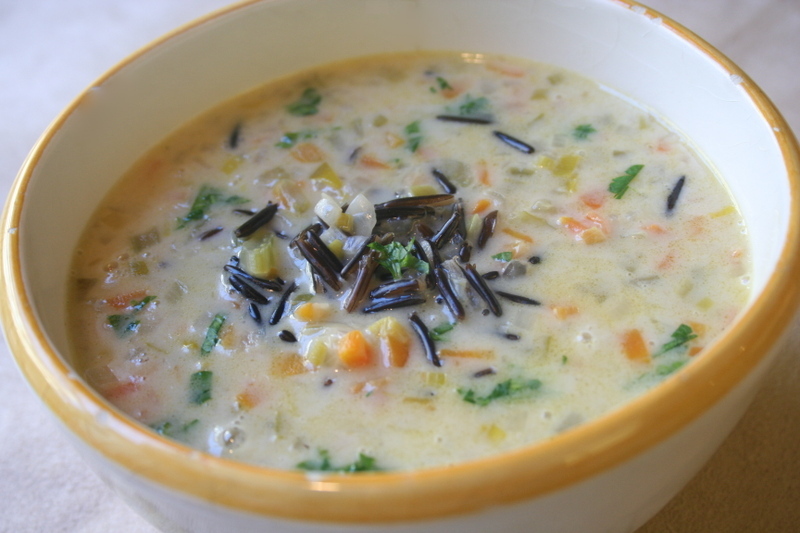 This made with love Happy Diabetic Chicken and Wild Rice Soup is light and nourishing and quite easy to make. The rice adds great texture and flavor. Freeze this one to have on hand when you are pressed for time. Top with toasted almonds and thinly sliced green onions to add a final flair or even some fresh spinach during the last 10 minutes of cooking. Add chicken broth then bring to a boil. Add chicken breast halves and cook until no longer pink in the center, about 10 minutes, remove the chicken to a bowl and let cool. When they are cool enough to handle dice the chicken not ¼ inch dices, no need to be so exact. Add wild/brown rice blend to the pot then place a lid on top, turn heat down to medium-low and simmer for 40-50 minutes or until rice is tender. If the soup is not as thick as you like you can mix ¼ cup milk and a tablespoon of corn starch and add that to the soup slowly. What to thick…no worries add a little chicken broth or milk or even a little water. Preheat the oven to 375°F. Tuck the wing tips beneath the wing to avoid burning them. While the wings are roasting, melt the butter in a medium saucepan over low heat. Add the Sriracha, honey, salt, and lime juice, stirring to combine. Keep warm over low heat. 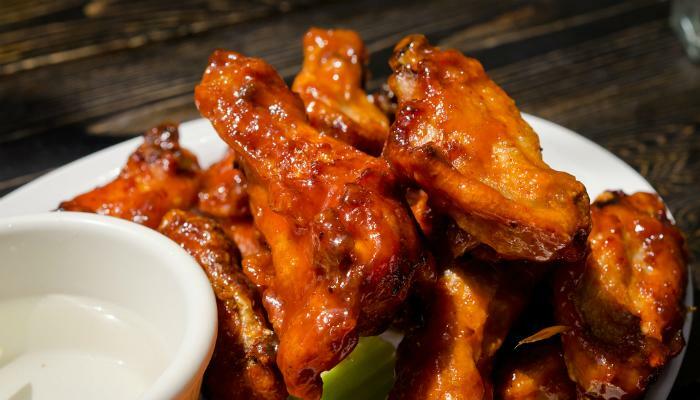 Put the cooked wings in a large mixing bowl and toss with the Sriracha mixture. Plate the coated wings on a large platter, garnishing with cilantro and sesame seeds. It’s no secret that I love Avocados in any form, but I think my favorite way to eat them is in guacamole. My St. Patrick’s Day guacamole is chock full of great Irish ingredients like sharp cheddar, carrots, bacon, parsley, and onion. Happy St. Patrick’s Day! In a large bowl, mash avocado with lemon juice, salt, and pepper. 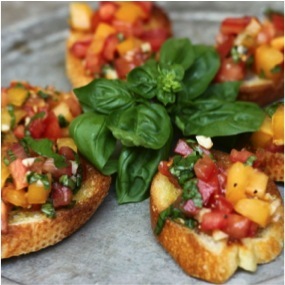 For a beautiful presentation, leave a small portion of the remaining ingredients out and use them for garnish. Stir in the carrots, onion, garlic, jalapeño, bacon, parsley, and cheese. Garnish and serve. Combine beans, corn, tomato, onion, scallon, cilantro,salt and pepper. Toss with the lime juice and olive oil. Marinate in the fridge for 30 min. Add avocado and Jalapeño just before serving. Recipe type: More dessert fun! First, wash the asparagus in cold water and trim away the lower ¼ of the stalk. 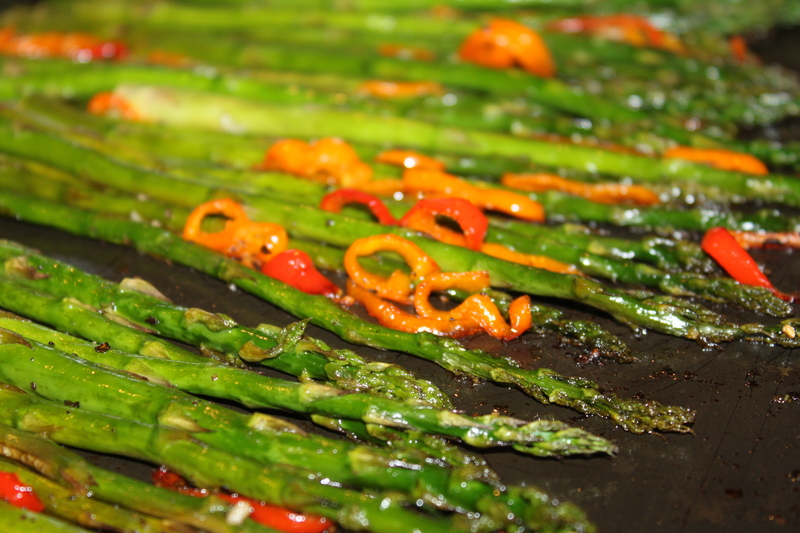 Toss the asparagus in a large bowl with ½ T of oil and ½ T chopped garlic. Add kosher salt and freshly ground pepper to your tasting. Roast at 425°F on a foil-covered baking sheet until stalks are soft and the skin is crispy. Turn the stalks at 10 minutes of roasting time. Cutting thin rings of red bell pepper to roast on top of the asparagus will offer a feast of flavor for your pallet and a feast of color for your eyes! 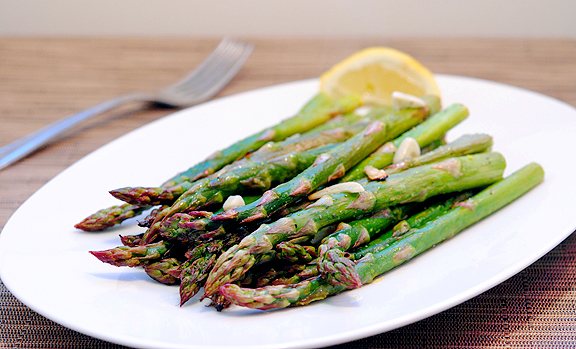 Top your cooked asparagus with a sprinkle of fresh lemon juice. Serves 4.